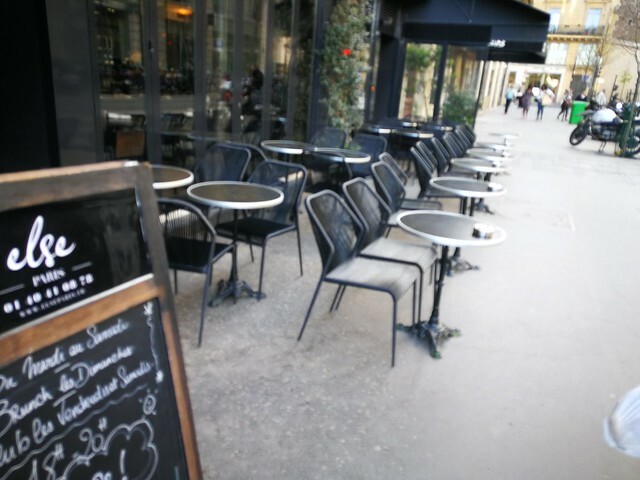 I’d been wondering why many French cafés have lines of outdoor seats facing the street. I haven’t seen it elsewhere and it has seemed odd to me. Yesterday I realised that its purpose is to enable the café’s patrons to get a clear view of people walking along the street. In other cultures, people watching tends to be frowned upon. It’s seen as voyeurism, an invasion of another person’s space and privacy, or at least failing to mind your own business. But for the French, it’s celebrated as an important dimension of the interplay between human beings. You don’t have to have business to transact with a person in order to look at them. An active gaze at someone is a statement in response to the way that person has often deliberately projected a particular energy or visual aspect. It might lead to an exchange of words or more, but usually it’s just as fruitful if it doesn’t. It’s about performance and spectacle and etching yourself into the consciousness of others. To do that, something about your dress or accessories or movement needs to stand out from the crowd. Instinctively I do the opposite, so that I blend into the crowd. It’s how I was brought up. I delude myself into thinking that I am not being people watched, and that that’s the way it should be. But yesterday I realised that nobody in the streets of a big city is anonymous, and that that’s a good thing. It was when a woman came up to me to express admiration of my Australian-designed Crumpler loose fabric draw string backpack. She had people watched me, and in this case it had led to a conversation, about how she might be able to buy one for herself. Then in an art gallery, an older woman who was an attendant gazed at me. But not in a way that suggested a suspicion that I might damage or steal an artwork. There was a slight smile and a facial expression approaching awe. I interpreted it as a compliment. I had looked admiringly at the smart bright yellow shawl she was wearing, and perhaps she had noticed my notice of her and was reciprocating. I will never know. But it is an intriguing pleasure to wonder about it. I think the lesson is that we don’t need to hold back when we find ourselves drawn to look at somebody who, in our estimation, stands out. They have made themselves up, precisely because they like to be looked at, and it is a source of satisfaction for them that another person has noticed them. The French put great store in the quality of their presence in the street or at a public event. It’s almost sacramental. It’s about performance in a culture that esteems performers. They would not think much of parents in other cultures who admonish their children for ‘making a spectacle’ of themselves. The act of making a spectacle of ourselves and being noticed is not an escape from reality. Instead it’s an embrace of the world, and indeed the perfect cure for melancholia, depression, and poor self-esteem.